Former England winger John Barnes has criticised the supporters who booed Frank Lampard at Wembley on Saturday. Chelsea midfielder Lampard, 29, came off the bench during England's 3-0 Euro 2008 qualifying win over Estonia and was targeted by some England fans. Barnes, who was booed during his career with the national side, told BBC Radio 5live's Sportsweek: "It is just wrong. "This is not a healthy situation either for Frank or for the team. It doesn't help him or the other players." Barnes was subjected to plenty of criticism during his England career, which spanned 12 years and won him 79 caps. He believed the boos directed at Lampard will have a negative effect on some of the other England players as well as the former West Ham star. Barnes added: "Frank is an England player and we all want England to do well, the problem is this sort of thing does transmit to the rest of the side. "As much as the other players will be happy they are not the ones being booed, it is not a positive situation for any of them. "Having been someone who has been through that situation where you have been singled out by England fans, it's not a good situation to be in." Saturday's game was the first time for four years that a fully-fit Lampard has not been picked for the England starting XI in a competitive international. But Barnes believes he still has an important part to play for England and could line-up alongside his replacement, Gareth Barry, in the future. "Barry has probably been England's most consistent player for the last three games and he deserves to play against Russia," said Barnes. "But long-term, you cannot write off any combination, including Lampard playing with Steven Gerrard and all three of them playing together." Lampard's Chelsea team-mate Joe Cole has also slammed the supporters who booed Lampard when he came on in the 70th minute. 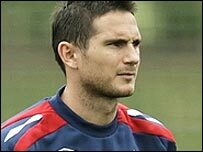 Cole said: "Frank has been one of England's most consistent players over the years and he has never let England down. "It is not nice to hear that, it is not nice to hear one of your mates getting that. "He is a top player, for me he is one of the top players in the world and for me, he doesn't deserve it. "The only thing I would say he is one of the best players I've played with. Not so long ago he was England's Player of the Year, and rightly so."